Velikost tohoto PNG náhledu tohoto SVG souboru: 375 × 600 pixelů. Jiná rozlišení: 150 × 240 pixelů | 300 × 480 pixelů | 480 × 768 pixelů | 640 × 1 024 pixelů | 723 × 1 156 pixelů. 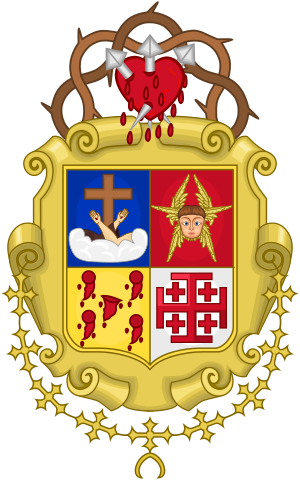 English: Coat of Arms of the General Minister of the OFM. Lacks the decorative external decoration. English: Wappen des Generalministers der Franziskaner (OFM).